‘THE Secret Millionaire’. The sobriquet to his name doesn’t sit easy with John Concannon. It’s not how he sees himself, and neither is it a lifestyle to which he’s accustomed. Even in the course of conversation, the man who was the driving force behind a branch of Pieta House West in Tuam avoids mentioning it. But the link is welded in the public imagination now. Any mention of Pieta House West triggers a rolling tongue mention of John Concannon and ‘The Secret Millionaire’ in most discourses. ‘The Secret Millionaire’ was the title of a television programme Animo TV productions produced for RTÉ. John Concannon was the philanthropist on the first screening. It was because of his appearance that the notion of Pieta House West in Tuam was conceived. A year earlier, and on another platform, the idea of John Concannon taking part in the series came about. ‘The Secret Millionaire’ was only a brainwave in its infancy when Animo Productions were filming another television series, ‘Celebrity Bainisteoir’. John Concannon is a Kilconly man from the village of Ironpool. Kilconly were one of the teams featured in the 2010 series. They were managed by Celebrity Bainisteoir Breffny Morgan, himself a contestant the TV3 series ‘The Apprentice’. Kilconly were sponsored by Concannon’s company JFC Manufacturing in Tuam. He established the plastics manufacturing business in 1987. He’d already had his ‘fifteen seconds’ of television exposure. JFC had invented the infamous triple bucket, an apparatus designed to feed three calves in one feeding time. In December 1987, Concannon appeared on the Late Late Show; his interview explaining the intricacies of his invention to host and compere Gay Byrne has now become an iconic happening in impromptu television moments. But it was his second appearance over two decades later that caused an even bigger sensation. Kilconly’s progress in the ‘Celebrity Bainisteoir’ competition led them south to Kerry to play Castleisland Desmonds. Producing ‘The Secret Millionaire’ series for RTÉ was already a notion Animo producer Jean Devlin was toying with. In a pub in Castleisland she asked Concannon if he’d do a screen test with a view to appearing on the series. From there the notion took root, but only after he’d discussed it with his wife Patricia, his family, and his work colleagues and staff did he consent to the idea. And even at that, it wasn’t until a conversation with a business colleague that he finally made up his mind. Concannon travelled to Dublin by train for the filming of the series. In Galway railway station he was handed an envelope containing a key to a flat and the address of where he’d be billeted for the duration of the filming. For the purpose of a disguise, he assumed the name John Brennan. Brennan was his mother Moira’s maiden name. He masqueraded as a Mayo social worker involved in a television documentary about social issues in the poorer regions of the city. He had no set agenda or a brief to guide him. At Heuston Station Concannon met Dublin taxi driver, John Quinn. “It was only by chance I got into John’s taxi and there was no preplanning that he would be there waiting,” he told The Mayo News. “John Quinn became my regular taxi driver. He too, like almost everyone else, had a story to tell. His son died by suicide and through that awful tragedy in his life he became aware of Pieta House. 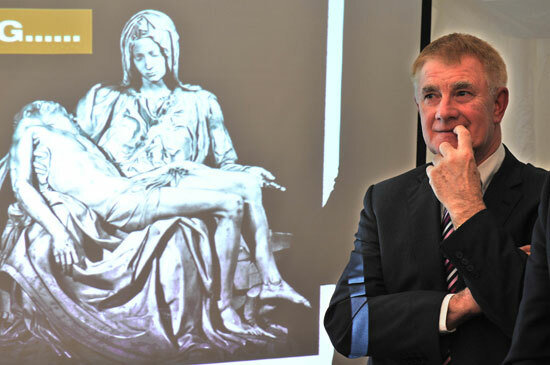 John Quinn brought Concannon to Pieta House where he met Pieta founder and CEO Joan Freeman. “It was on that visit I decided I was going to do all in my power to open a branch of Pieta House in the west of Ireland. I knew there was a need for such a service. On his return, Concannon set about fundraising. “There was no way I was going to do this by myself and it was only because of the commitment of a group of businessmen and women who came on board with me that the dream became a reality. Everyone I mentioned it to put their shoulder fully to the wheel and the wider region rowed in behind the notion. With that kind of enthusiasm it couldn’t but succeed. “Pieta House opened its doors in December 2013. It’s a purpose built house offering a free and confidential counselling service in the prevention of suicide and self-harm. It’s staffed by professional counsellors and therapists. The important thing is the service is free. It’s there for anyone in Connacht who needs it. It’s through the supporting of the various fundraisings we undertook in the different counties that Pieta House West is now in Tuam. “But it’s not about John Concannon and I’m anxious now to take a step back and let Pieta House West get its own identity through the work it does. Even in the short time it’s in existence, it’s already doing that. There are no trappings of success or the living of a lavish lifestyle on the John Concannon sitting behind the desk of his JFC office in Tuam. Fame or publicity he never solicited or courted. But any mention of Pieta House West instantly prompts an echoing of John Concannon’s name and ‘The Secret Millionaire’ television programme. It darns the yarn of how Pieta House West in Tuam came about. It will ever be the house that John built. But only with a lot of help from his friends. And John Concannon will ever be the first to remind you of that. Pieta House West was this year’s Mayo News/O’Neills Club Stars charity partner. All the proceeds from last Saturday night’s charity banquet will be donated to the Tuam facility.